Art is all about form. Forms are represented everywhere – in space, on earth, in nature, in society. One has to be able to read and to understand those forms in order to create something new. In my music I like to use ‘found mathematical objects’: simple automatons which build forms over time. When I encountered Aristid Lindenmayer’s ‘L-systems’ some time ago, I became fascinated with these rules to describe plant forms and growth. The organic development and the self-similarity of the plant forms seemed to be perfectly translatable to music. 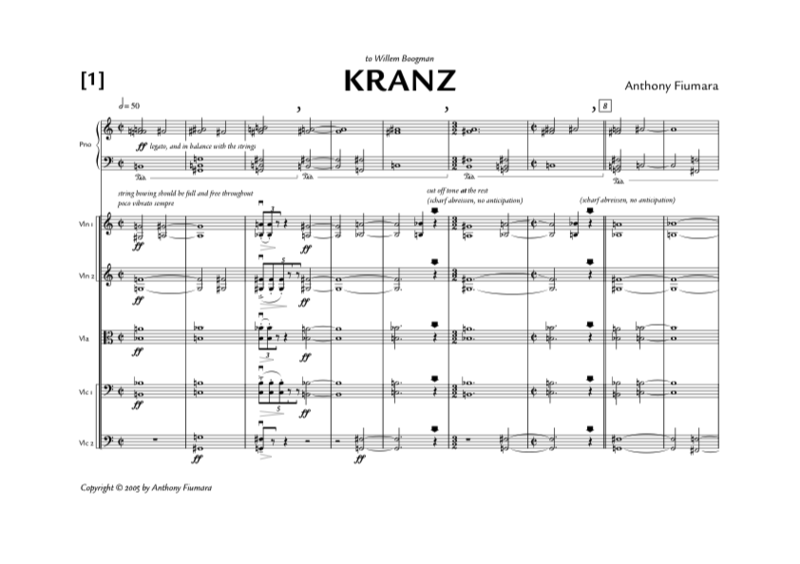 That’s how the idea for Kranz was born: a work that uses a simple Lindenmayer axiom, of which I translated the first five recursions (a slowly growing repetitive structure) to a score for piano and string quintet in five parts. Kranz is dedicated to my dear friend and colleague Willem Boogman. November 17, 2005, Bochum (Germany), by Luxembourg Sinfonietta & Marcel Wengler (conductor).